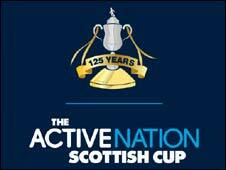 Stenhousemuir booked their place in the fourth round of the Scottish Cup with a 5-0 thumping of Cove Rangers. Kevin Motion started the rout in the first minute and Craig Molloy doubled the hosts' lead a minute later. Any hopes of a Cove comeback were dashed when Kevin Bradley made it three in 13 minutes. Stennie keeper Chris McCluskey saved Kevin Webster's penalty before Iain Thomson made it four and Motion grabbed his second to seal a convincing win. Stenhousemuir: McCluskey, Lyle, Stephen Thomson, McLeod, Smith, Molloy, Iain Thomson, Scullion (Love 69), Dalziel, Bradley (Halpin 80), Motion (Stirling 55). Subs Not Used: Bennett, O'Reilly. Goals: Motion 1, Molloy 2, Bradley 13, Iain Thomson 30, Motion 34. Cove Rangers: McKenzie, Cruickshank, Black (Lawrie 62), Bain, Watson, Heads, Henderson, Johnston, Buchan, Webster (Stephen 71), Milne (McCulloch 46). Subs Not Used: Windrum, Phil Reid.